We call the A-101-9 an universal vactrol module. It contains two identical sub-units. Each unit has two vactrol outputs available that are controlled manually (Man control) and by an external control voltage (CV In) with attenuator (CV). A vactrol is a combination of a light depending resistor (LDR) and a light emitting diode (LED) both put into a small light-proof case. For more general details about vactrols please look at the Vactrol Basics page. Increasing the LED brightness causes a decrease of the LDR resistance. The LED at the front panel displays the brightness of the LEDs of the vactrol pair in question. The resistance of the two vactrols changes simultaneously. This allows to control two parameters at the same time or to control a parameter that requires two resistors at the same time (e.g. certain filter circuits). The LDR terminals of each vactrol are connected to the jack sockets labelled VAC1 and VAC2. In contrast to other A-100 sockets the VCA1/2 sockets are not grounded, i.e. the two terminals of the vactrol are connected to the two terminals of the socket in question. Applications: The module introduces voltage control to any function that is controlled by a manually adjusted variable resistor (i.e. a potentiometer with only 2 terminals used). 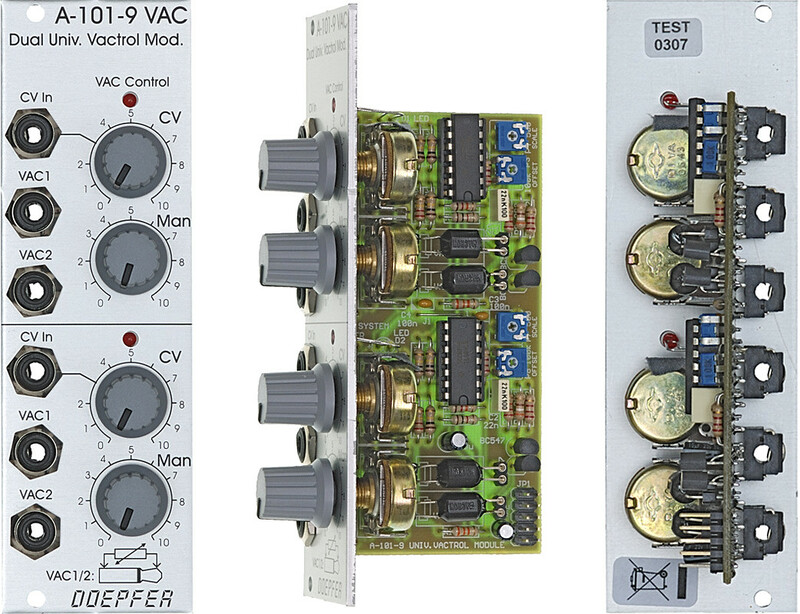 Some examples within the A-100 are: Attack, Decay, Release of all envelope generators (A-140, A-143-1, A-143-2), slew time of slew limiters (A-170), delay time and duration of trigger delay (A-162), clipping functions of the extreme filter (A-106-1), clock rate of digital noise (A-117), random rate and level (A-118), waveshaping function for A-110. A lot of application examples within the A-100 are described in the appendix of the A-101-9 user's manual. But even so far non-adjustable parameters that are determined by a fixed resistor can be made voltage controlled. But the module can be used not only within the A-100 as the vactrol outputs are completely free (no connection to A-100). The module can be used in combination with any other equipment too that uses a variable or fixed resistor to adjust a parameter (e.g. wah-wah or parameters of other effect units). Even for "circuit bending" the vactrol outputs can be used. The A-101-9 module is intended only for users who are familiar with electronics as some soldering is required to install the vactrol connections on the module or device that has to be controlled by the A-101-9. For all A-100 modules that can be combined with the A-101-9 we will collect all the required information (i.e. the position of the two solder points for the parameter/potentiometer in question). and a service for A-100 users who are not familiar with soldering/electronics. If there is sufficient space at the front panel of the module in question an additional socket can be added. If there is not sufficient space at the front panel a blind panel with additional socket(s) has to be mounted next to the module. The connection between the additional socket(s) and the vactrol output(s) of the A-101-9 is made with standard patch cables. For external devices (e.g. effect units) the user has to find out the solder points in question himself (a schematics of the device will be very helpful). We have to point out that the user is responsible for any damage that may appear at the module or device that is modified to be connected to the vactrol output of the A-101-9. All modifications are at your own risk! Normally the vactrol is connected in parallel to the resistor/potentiometer that controls the parameter in question and the potentiometer is set to it's maximum value (e.g. 1MOhm). The dark resistance of the vactrol is several MOhm and consequently has no or little effect to the overall value. As the brightness increases the vactrol resistance becomes smaller and has the same effect as operating the potentiometer. But the potentiometer can be used also to determine the upper value of the parameter in question if it is not set to it's maximum value. Typical example: a 1MOhm potentiometer is used to control the decay of an envelope generator by discharging a capacitor to GND. The vactrol is connected in parallel to the decay potentiometer. The setting of the potentiometer defines the maximum decay time as the vactrol can only reduce the total resistance and consequently reduce the decay time. The A-101-9 cannot be used (or only with limitations) to replace a three-terminal-potentiometer (voltage divider) as the vactrol is a two terminal element only. Under certain conditions a three-terminal-potentiometer can be replaced by a fixed resistor and the vactrol connected in series. But this is possible only if the circuit is not sensitive to the overall resistance (vactrol+fixed resistor) as this changes while the vactrol changes it's value. One has to look at the schematics if this is true or try it out. A midi controlled stand alone version (not an A-100 module) that will also include some switches is under development. Latest news: The module has been redesigned with polarizer function for the CV inputs. During our tests we found that it is useful to have both directions available. For some applications a decreasing vactrol resistance with increasing control voltage is required, for other applications the opposite is the better solution. The polarizer function will avoid the need of an additional voltage inverter A-175 for the CV input. Unfortunately the front panels have been printed already. Consequently the scale of the CV controls will be not correct for the first series of the modules.